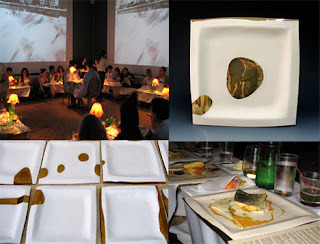 Epicurean design and gastronomic multimedia set the stage for inspired cuisine at Williamsburg’s Monkeytown during NY Design Week 2008. There were five sold out seatings to an enthusiatic audience. If you attended and would like to purchase a gold accented plate from the the Luxury Series please email info@kathyerteman.com for images and prices.